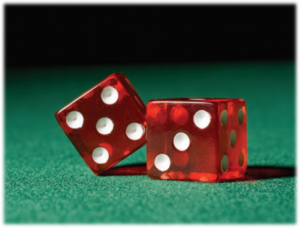 Seven easy tips on how to win at craps more often. Like every game on the casino floor, craps is a game of negative expectations; at least, it is for the players. Every wagers (outside of taking odds) comes with a house edge of some size, scaling from as low as 1.36% to as high as 16.67%. Unless you’re the owner of the casino, you can’t possibly expect to win every game. On the other hand, as a player, you can increase your chances of winning craps more often. All it takes is a few simple adjustments in the way you place your bets—as opposed to someone who isn’t aware of the finer points of the game. The following seven tips should help you make better decisions, and avoid the many pitfalls of the game. Before you play, you need to really understand the game. Casinos will often host free craps classes. Sign up for one of these, or watch a good video tutorial on the game. Take some time to practice for free at an online casino, or download a free craps app to test your knowledge. Not all craps lessons will teach you about odds. These are extremely important wagers; the only bets in any casino that come with a 0% house edge. Learn all you can about taking odds. The more you know, the higher your chance of winning at craps. Take odds, and increase those odds, every chance you get. If the shooter rolls 4, 5, 6, 8, 9 or 10, all Pass / Don’t Pass bets become Come / Don’t Come bets. These are wagers that the first rolled number will (Come) or won’t (Don’t Come) roll again before a 7. These are the only bets you need to worry about for now, and take odds on whenever possible. You may decide to move into Field and Place bets as you progress, but whatever you do, avoid the more complex options. These craps bets have a much lower expectation (higher house edge). Risking money on something that’s less likely to initiate a winning payout is not cohesive to the goal. If you take the casino’s class on craps rules, odds are they’re going to explain the so-called benefits of hedging your bets. There’s no real benefit to doing this. Mathematically, it will not help you. If there’s one thing everybody can agree on, it’s that the crowd around a craps table can be extremely boisterous. They yell, they laugh, they cheer wildly or cry out in anguish. The emotional swings can be as flamboyant as the players themselves, but one thing remains a constant—players always support one another. It creates for an extremely entertaining communal atmosphere. And the more players there are around the table, the more entertaining it can be. As I said above, you can’t always win. If you’re having a great time playing—and being responsible with your bets—the entertainment you get out of a losing experience can still be worth the cost. And this, my friends, is how to win at craps, even when you’re not really winning.